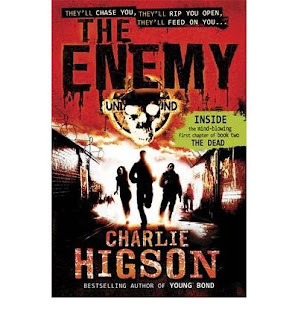 "In this dystopian thriller set in London, everyone over 16 is dead or diseased, and youngsters are in constant danger of being eaten by boil-infested grown-ups who roam the streets like zombies looking for children to kill. Led by teens Arran and Maxie and armed with makeshift weapons, a group of kids sets out from the uncertain safety of an abandoned supermarket to travel to Buckingham Palace, where a young messenger promises that food, medicine, and a haven are available." Sometimes I wonder if I expect too much of YA books. Normally after I’ve read a few in a row that just didn’t connect with me I start to think along the lines of ‘these books are intended for a younger audience, after all, you can’t expect it to fully engage an adult mind…’ But then I’ll think of books by YA writers such as John Marsden and John Green and Sarah Rees Brennan and I’ll realise that, no, I don’t expect anything that a YA book is not entirely capable of delivering. I firmly believe that writing a good YA book is ten times harder than writing a book for adults, but on the flipside a YA book done well hold 100 times the rewards for the reader. Is The Enemy an example of one such amazing YA book? Nope. It’s not bad, its not great, mostly it just is. Most of the problem I had with is that the plot is annoyingly familiar. I’m not referring to the whole post apocalyptic zombie thing, because I’m a huge (huge!) post-apocalyptic fan and I love to read different takes on what is usually a similar scenario. But you see, I only recently read Gone and The Enemy shares that book’s central premise of ‘all kids, no adults.’ Now, this is not really The Enemy's fault. I don’t even know which one was published first and it’s not like the two authors even approach it in exactly the same way. But still, the similarities struck me. Less easy to forgive is how closely the plot of The Enemy mirrors that of one of my favourite zombie flicks, 28 Days Later. In a broad ways, like being set a London where the majority of the townsfolk have gone rabid, but also in more specific ways, like the danger fraught journey to discover a safe haven that, surprise!, is not so awesome as it first seems. But I’ll forgive all that. As they say, there are only a finite number of stories in the world and it all comes down to how you tell it. The problem is, Higson doesn’t tell it all that well. The main problems? The characters. In that you just don’t care about them. First problem: Higson is all tell, no show. Straight up, whenever a character is introduced he tells us what kind of person they are, which completely takes the fun out of discovering that for ourselves. The only character I actually felt some kind of connection with was Small Sam. Where the rest of the characters want some vague safe future, Sam wants to find his sister. Where the rest of the characters stand around and bicker a lot Sam is constantly on the move, making things happen instead of having things happen to him. Unfortunately there are so many characters in this book Small Sam gets little scree time. Higson could easily have cut the book down. For example I never got what the point to the interludes with Callum were. He stays behind when the rest of the kids go and literally just hangs out feels sorry for himself. There was also Sophie and her band of archers, who had the potential to be really cool, but just kind of hover in the background and then leave. I suspect these two plot threads, and others I haven't mentioned that were just as puzzling, will come into play in the second book. To be honest, if we exclude Small Sam's story, pretty much the entire book felt like an extended set up for the next one with Higson getting all of his characters into position. Which means the next volume, 'The Dead' will probably be a whole lot better than this one, but I probably won't read it because a whole book of set up is damn annoying.